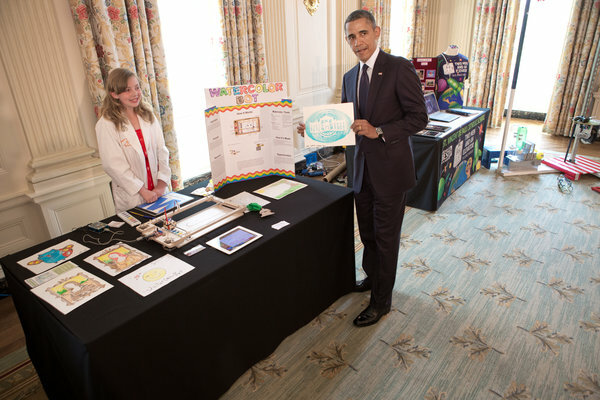 White House | Sylvia's Super-Awesome Maker Show! For those that missed it, Sylvia has been working like crazy for months cooking up a brand new set of real life project books! 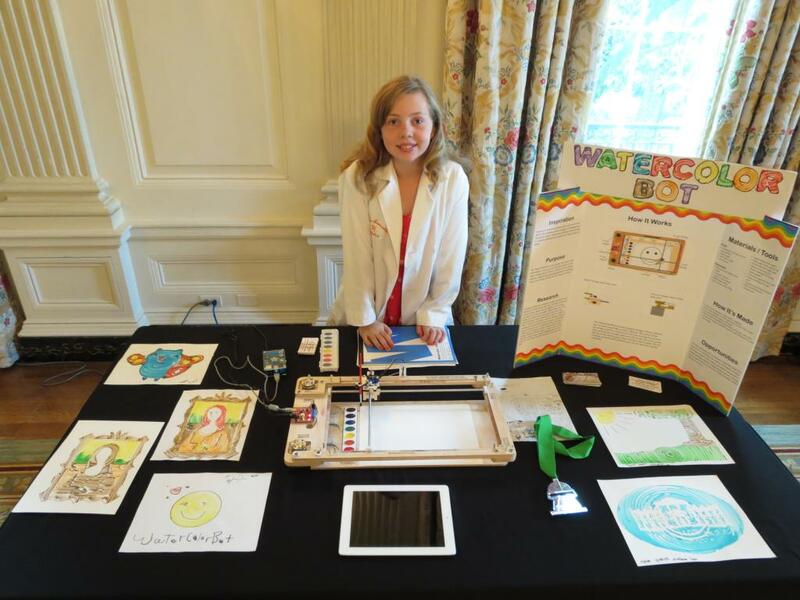 ...also she's been invited to attend the White House for their very first Maker Faire on Wednesday June 18th, 2014! 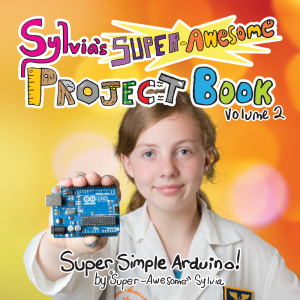 Announced as her surprise project at Maker Faire Bay Area 2014, "Sylvia's Super-Awesome Project Book" series is going to be a set of books published by CMK Press featuring project topics from various episodes, along with a bunch more in-depth details and project extras that we just couldn't cover in the show. 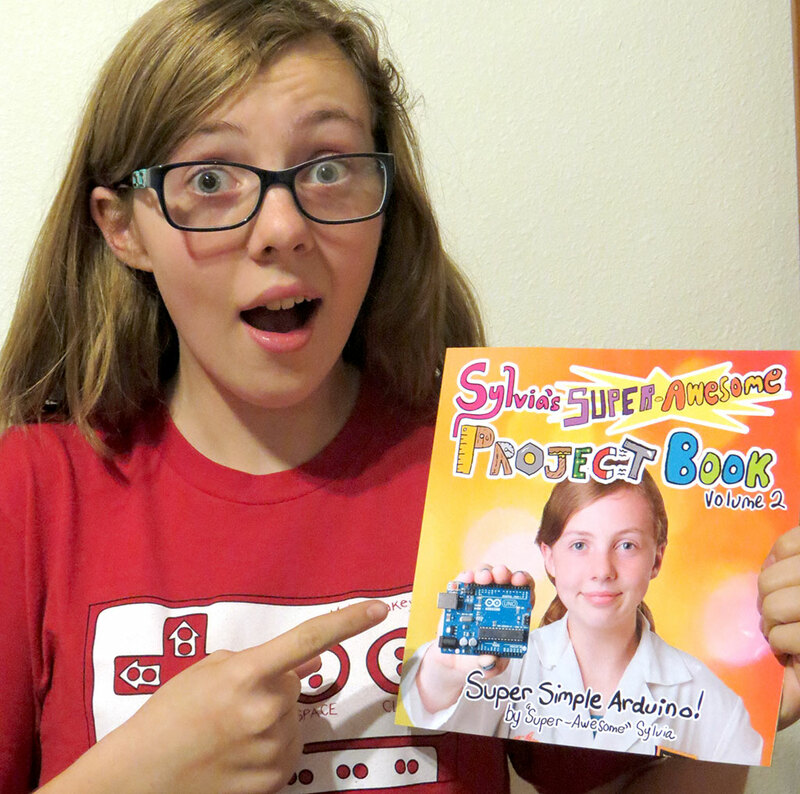 First book should be out late July 2014, titled Super-Simple Arduino. 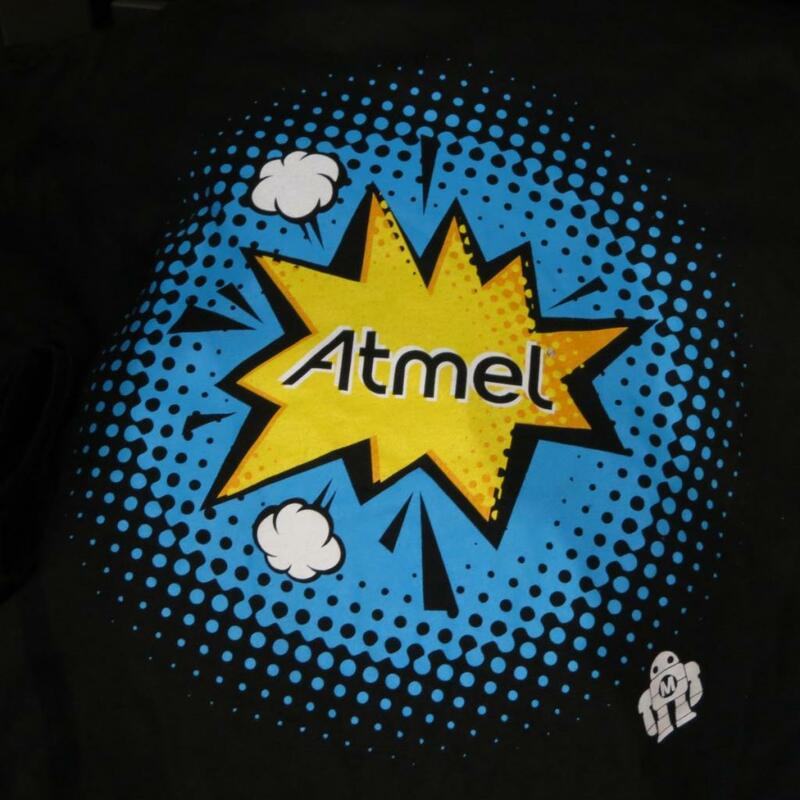 Happening a little sooner, Sylvia (along with me, CraftNinja mom and little sister Terrific Talulah) will be in Washington D.C. this week for the very first White House Maker Faire, thanks in part to travel sponsor Atmel's unwavering dedication to education and the young Maker community, they rock! For the majority of Makers wishing to take part in the festivities, don't worry! June 18th has been officially proclaimed as the National Day of Making. Get together with your local maker space, hacking group, or just your family, and get out there and make something! Post pictures and use the hash-tag #nationofmakers to let the world know that you're doing your part and making something awesome together. There's tons of other suggestions on the Day of Making site, so go check it out! We'll be tweeting from the event live as long as we've got connectivity, so check @MakerSylvia for updates before, during, and after for all the fun and surprises we're bound to find there. Good luck makers, young, old, and future. Lets all get out there and make something this June 18th and prove we are (even around the world) a #nationofmakers. WHite HoUse SCience FaiR? WHaaa? This month has been crazy!! Robogames 2013, TWO Science Fairs, and an interview with Bill Nye and Levar Burton... in the same week?! HOLY MOLY!!! 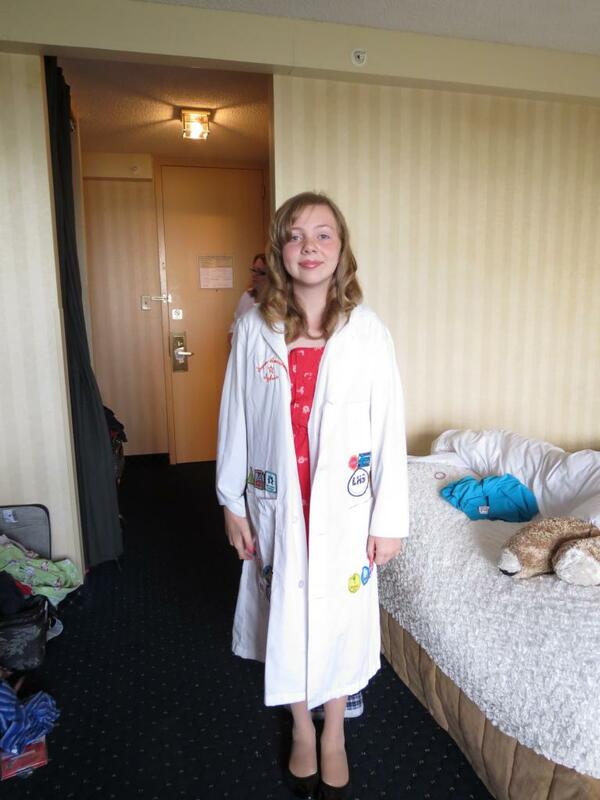 Just a few weeks ago, I got a call from the White House staff, and they invited me to go to their 3rd ever science fair! Last year, Joey Hudy got chosen to go for making awesome kits, and got to show off his big orange marshmallow cannon. This year, MAKE magazine and Cognizant nominated me to come! The most insane part was that I only got one week warning, my school 6th grade science fair was on the same day as the white house one, and we’d have to leave on the last day of Robogames!!! OH NOEsS!! Luckily my dad helped organize and put together a fundraiser on gofundme, and we raised the full goal amount in less than a day thanks to all the awesome people who donated and helped get the word out! WOO hoo! On the Thursday before the Science Fair, I left to San Mateo to compete in Robogames 2013 with my WaterColorBot paint pen plotter (fill wrap-up post coming later). After an exciting couple days at Robogames (and winning a silver medal! ), I boarded a plane to Washington DC, with my robot and project board all wrapped up in my awesome custom made carrying box. I was SOOOO excited!! When we got there, I was checked by security and led to the room where I was supposed to set up in. I didn’t have much stuff to assemble, so I had a ton of time to figure out exactly how I would do my demo, and what the heck just happened. Craziness!! After about an hour, some people started to come by and I showed off my WaterColorBot. My demo worked with a Raspberry Pi as the computer, and connected to the iPad with a WIFI adapter that my dad help me make into an access point. After all of the other kids set up and looked around, we went outside and had some lunch and talked with lots of important people. After lunch settled down, I got interviewed by Levar Burton and Bill Nye!! Oh My Gosh! At 12:30, the science fair officially opened to the rest of the staff and VIP’s that got invited. I talked to a BUNCH of cool people and really had some fun talking with them all about how the bot works, how I came up with the design, and how I think it'll be perfect for girls my age to get into engineering with once we make it into a kit. I also talked lots and lots about other things I liked doing, plus all about my show. I hadn't had much sleep, but even though I'd been standing and talking for hours, I was totally pumped. It's hard to describe, but getting up there and talking about something awesome that you know pretty well, that people really want to hear, and have interesting questions about, is a lot of fun, and you wouldn't think so. But it is.... and I knew I had to hold out for the POTUS! When it was time for the president to come in, all the regular people were moved into the entry hall. He then came in, said hello and started talking to the first booth. After a few teams/groups had talked with the president, I was next! He walked up, said hello and shook my hand. We talked, and then he held up my watercolorbot painted picture of the white house logo the press, and lots of camera shutters went off. 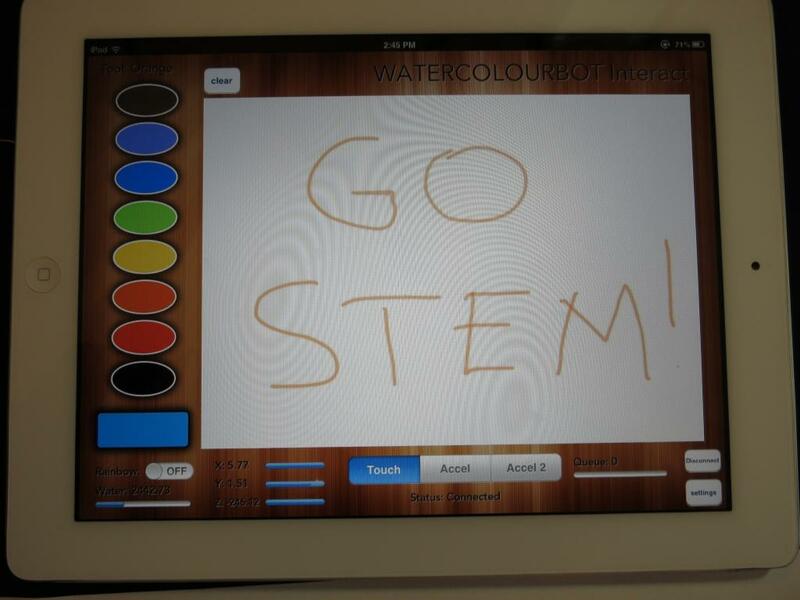 He then talked with me a bit and drew something on the iPad for the bot to draw, “GO STEM!”. At the end he shook my hand again!! I was thrilled! Meeting the president was so incredible and exciting! 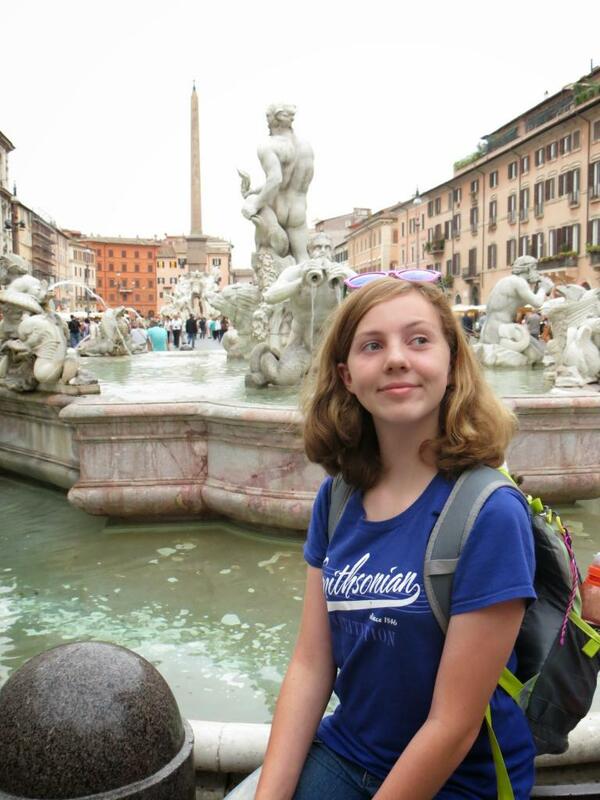 I had a TON of fun in Washington DC and I really hope to go there again. Even though I got to meet the president, I’m still just regular old me, and I think any kid my age could get to be where I was, if they just don’t give up and keep going at their crazy ideas. Even if nothing new happens because of my trip, I’ll be sure and keep my friends at the White House forever. 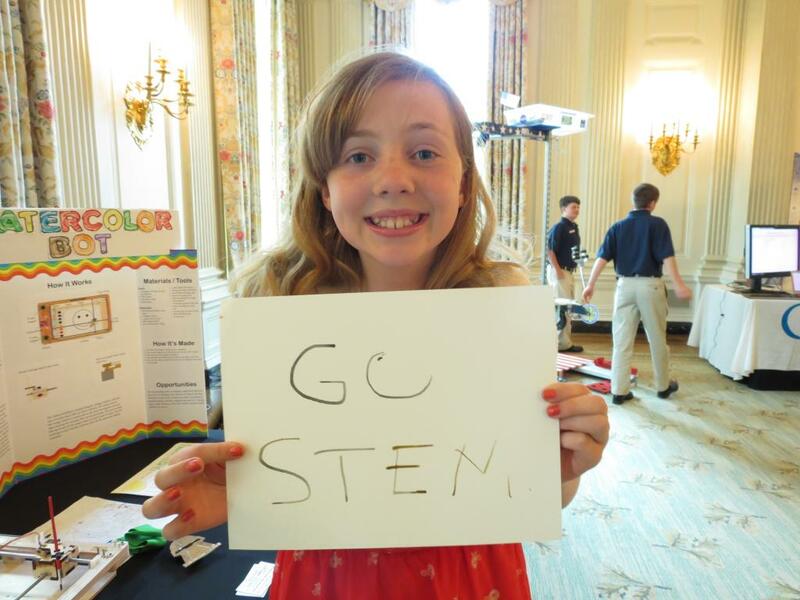 White House Science Fair & Robogames!! White House? Yes! Robogames? Yes!! Crazy non-stop roller-coaster of life? Definitely. 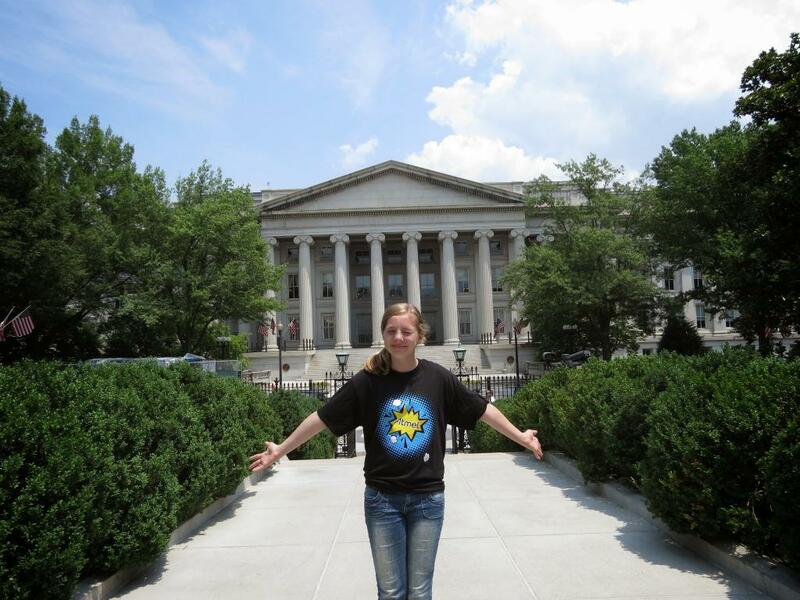 UPDATE: Sylvia announces the Science Fair for the White House! And be sure to watch the live event at wh.gov/sciencefair, or at wh.gov/live, beginning at 11:30am EDT (8:30am PDT) on Monday, April 22, 2013. Brentwood School STEAM Day was a blast, we saw the sights, and helped over 40 kids walk away with a brand new mintyboost, and a respect for making things with their soldering irons. Both worksheets used at the event are now available in the printables section. Wrap-up post to come. Not long after, Sylvia was invited to a hangout to talk about the Maker movement with Tom Kalil at the White House, bringing together a bunch of other really awesome maker peeps to talk about how we can make things better in education with making things. 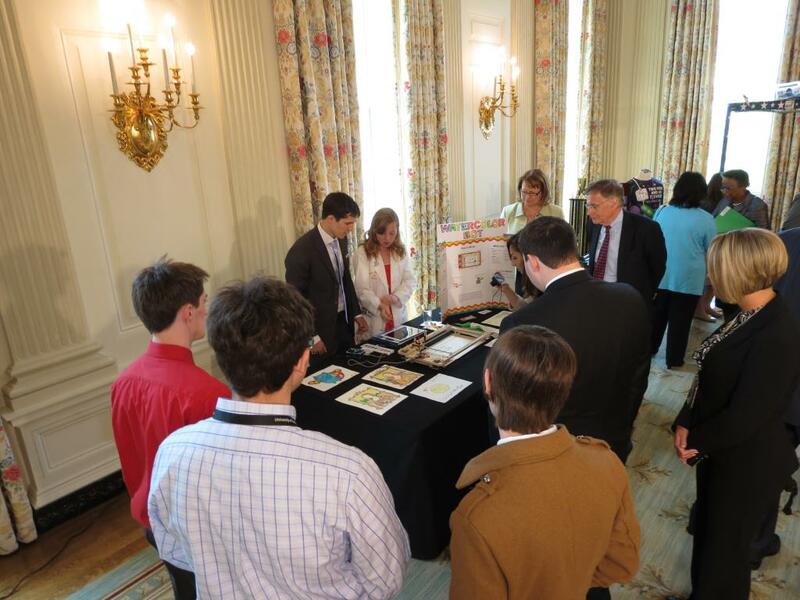 We even managed to get the WaterColorBot to have its own video feed while it drew the White House Logo! Then only about 3 weeks later, we got one more call from the White House: an invite to their 3rd ever Science Fair, and to bring a project of Sylvia's choice!! Though the date was only a week away. What could she possibly bring? 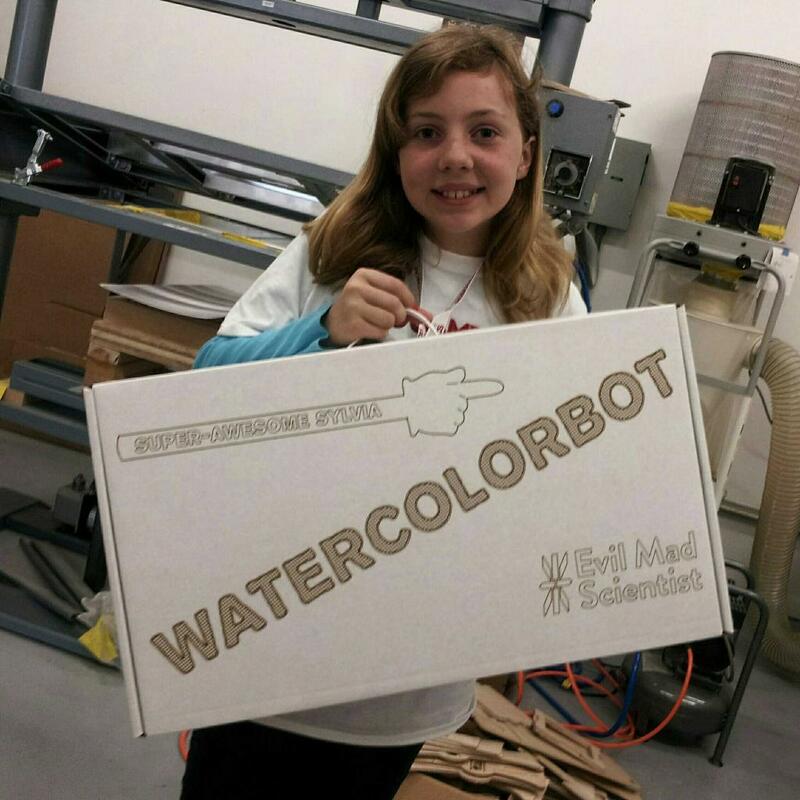 The WaterColorBot! With a few hardware tweaks, and some software help (from Dad, and from Robotgrll for the iPad app), she thinks she's ready. Then there was the problem of how to fund such a crazy trip with less than 4 days to do it. We asked Evil Mad Scientist Labs and they graciosly promised to match all donations up to $1,242! We then managed to pull together a funding campaign with GoFundMe in about 4 hours, and once it was launched, made our funding goal in less than 23 hours thanks to the incredibly awesome people on twitter and facebook! 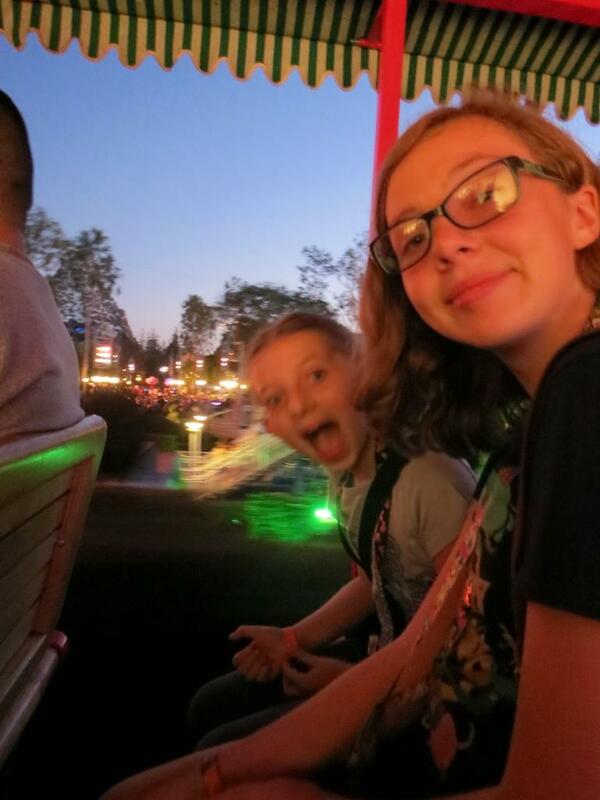 You can still donate to Sylvia and the cause here, and extra funds go towards making awesome shows, and getting young girls into tech. So now we've made our goal, bought our tickets, and now we're ready to go. If you're in the San Francisco area, come see Sylvia and her White House bound Watercolor painting robot at Robogames! We'll be there all day Friday and Saturday, then fly out Sunday at 3pm and head out to the White House Science Fair. No you can't join us there, but you will be able to see it broadcast live online at whitehouse.gov/live on Monday, exact time TBA. 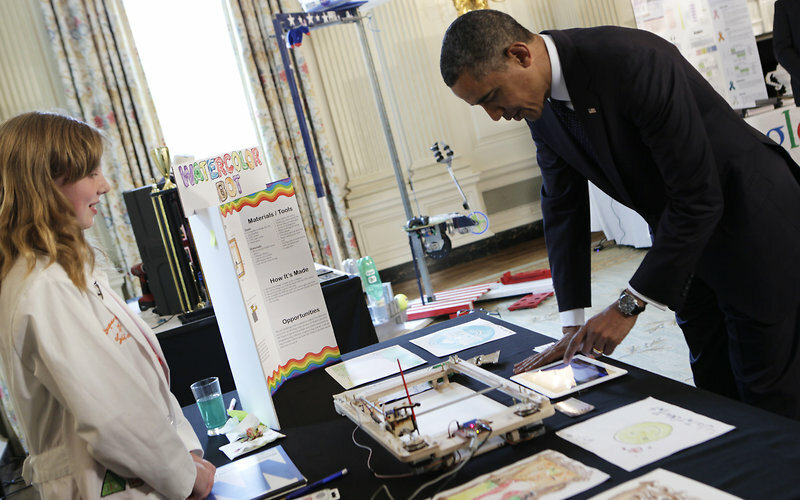 Read more about White House Science Fair & Robogames! !